Do you know of a blog that is worth nominating? Do you want to nominate your friend's blog or your own blog? Then now is your chance. 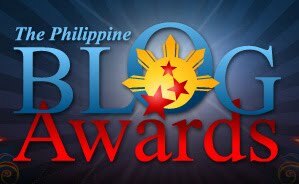 For the fourth year in a row, the Philippine Blog Awards will be held and the nominations are now open. Here are the categories for the 2010 Philippine Blog Awards. Nominations will start August 22, 2010. The 2010 Philippine Blog Awards will be held on three different dates and venues in Mindanao, Visayas and Luzon. This has been made possible with the partnership of the PBA with bloggers across the country the Awards Night will be held alongside the Visayan Blogging Summit in Iloilo City and the Mindanao Blogger Summit in Zamboanga City. Nominate your favorite blogs now by CLICKING HERE. Don't forget to read The Nomination Process and Eligibility and Guidelines 2010.